It's the perfect marriage of a ride concept to a story. What better way to immerse guests in the beloved world of Pixar's film, Cars, than to plop them into revved-up vehicles, drive them into Radiator Springs to meet the talking-autos gang, and pit them against another carload of guests for a thrilling race-to-the-finish finale? In the hallowed tradition of Disney's E-Ticket rides, Radiator Springs Racers delivers a grand-scale, gee-whiz, you-gotta-try-this-to-believe-it experience. Thrill Scale (0=Wimpy!, 10=Yikes! ): 4.5. 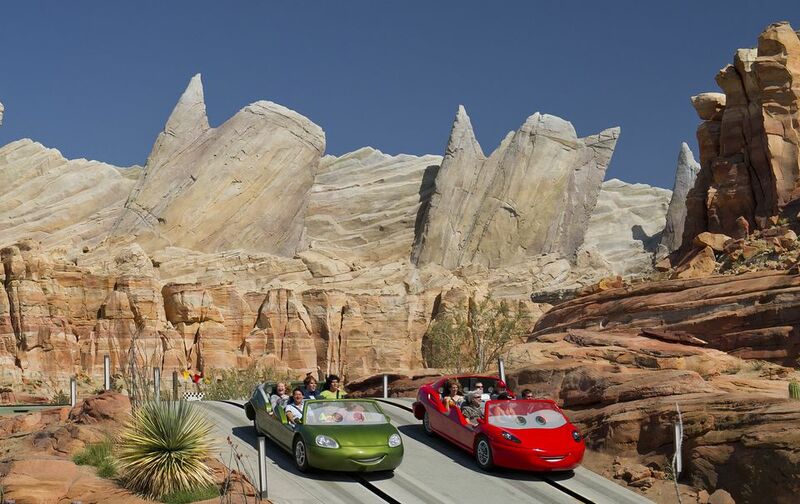 Radiator Springs Racers makes our list of Disneyland’s top thrill rides. Surprisingly fast, but not frenetic, action with a hint of coaster-like airtime. Some scenes feature mildly frightening near-misses. Could you handle it? The dark ride has a few "gotcha" moments, but only younger children would likely find them overly intimidating (and the attraction's height restriction would preclude them from riding anyways). The racing sequence is fast paced and does include a few minor butterflies-in-your-stomach moments. But if you are OK with relatively tame roller coasters (such as Big Thunder Mountain), you should be fine. Ride type: Dark ride with a moderate coaster-like finale. Fastpass: Yes. Be sure to grab passes early in the day for this highly popular ride or consider springing for Disney MaxPass. Single rider option is available and could save lots of wait time for guests willing to break up their groups. Tip: Consider riding at night for a more thrilling and evocative experience. Located at the far end of Route 66 and nestled in the striking Ornament Valley mountain range, Radiator Springs Racers is the highlight of Cars Land. The intermittent vroom! of racecars as they roar past and jockey for position lures guests into the ride. The queue snakes through the mountains (the exquisite rockwork is impressive even up close) and winds past some curious outposts, such as a house with walls made out of bottles -- the kind of oddity that can be found along the real Route 66. Diversions such as these make the (inevitably long) line more tolerable. Descending deeper into the mountains, riders board the vehicles at the Comfy Caverns Motor Park, which is a nod to the fabled highway's cave motels. Each car accommodates six riders and resembles the cute characters in the Pixar films, complete with eyes on the windshield and a mouth on the front fender. Once passengers are seated and buckled, the car leaves the station. The vehicles are brisk and responsive from the get-go and stop on a dime behind the cars lined up ahead of them as they haltingly move forward and wait to be dispatched. That's by design. Each vehicle has its own onboard computer and is aware of nearby cars to avoid collisions, according to Steve Goddard, one of the ride project engineers from Walt Disney Imagineering who designed the attraction and rode Radiator Springs Racers along with me. The computer knows its position on the track and what speed the car should be going at all times. The initial part of the ride is leisurely as the car ambles through the outskirts of town. The first goosebumps moment happens as the vehicle rounds a bend and slows to take in the majesty of the Radiator Falls waterfall. The music on the accompanying score that's pumped through the onboard audio system swells in recognition of the sight. The car then ducks into a mountain pass for the indoor dark ride part of the attraction as it heads for Radiator Springs. Before reaching the town, there are a few typical dark ride moments including some faux near collisions a la Mr. Toad's Wild Ride. The Sherriff emerges from a hideaway in the road (don't they all?) to warn the car to slow down and save it for—wouldn't you know it—race day. When we say that Sherriff warns the car, we mean that he talks with all of the emotion imbued in the movie's characters. Like the rest of the attraction's highly impressive animated figures, his body rocks, his eyes are filled with expression, and, most remarkably, his mouth moves convincingly. The next of the town's denizens to greet the visitors is Mater, the affable, drawling, buck-toothed tow truck. Proceeding in reverse to follow the ride vehicle, as is his wont, the truck's presentation is even more remarkable. "Mater is one of the most sophisticated animatronic characters,” says Kathy Mangum, WDI executive producer and vice president. "We had to fill him with life and personality. It was important we get him right." It's quite a sight to see the toothy truck, with his apparently rigid body, nevertheless articulate his words as he invites guests to engage in some tractor tipping. After the tractor shenanigans, the visiting cars arrive in Radiator Springs. It's all there, from Flo's V8 Cafe to the dashing Lightning McQueen. He, along with his main squeeze Sally, give the cars a pep talk and shoo them along for a pre-race makeover. Those heading left enter Luigi's Casa Della Tires, while those heading right make their way into Ramone's House of Body Art. The spray guns in the latter emit what appear to be—and smell like—car paint. There is a final sendoff from Doc Hudson (played with a gruff, but lovable demeanor by the late Paul Newman in the movie) and two carloads of guests line up for the big race. This is where the thrill part of the ride kicks in. Emerging outdoors, the cars enter a series of high-speed twists and turns, some of them banked as high as 45 degrees. How fast? Disney isn't saying, but like many of its rides, it's more the illusion of speed than actual speed that provides the thrills. A couple of camelback hills deliver some satisfying, but fairly mild, pops of airtime that lift guests slightly out of their seats. The car that wins, according to WDI's Goddard, is completely random. It is chosen by a computer and has nothing to do with the weight of the passengers or any other factors. In fact, despite having one of the engineers who designed the ride alongside us, we still lost. Goddard also explained that the slot running down the middle of each car's path serves two purposes. There is a bus bar under the slot that provides power to each vehicle's onboard electric engine and computer. There is also a roller coaster track beneath the slot that guides the vehicles. Wheels on the sides of the rails connect to a single "bogie" which is attached to the underside of each car's chassis. The winners and losers proceed to the final scene in Taillight Caverns, an underground oasis that has "stalag-lights" (glowing red automotive lights) mysteriously growing from the floor and ceiling of the cave. Mater and Lightning McQueen bid farewell to the contestants in the caverns. We don't know for sure, but we would be willing to bet the stalag-light pun was coined by Kevin Rafferty, concept writer, senior director, and master quipster from WDI who was also one of the ride's chief designers. The veteran Imagineer declares Radiator Springs Racers his favorite project (and that's saying a lot). "It's just the right mix of classic Disney immersive storytelling and thrill," he says. "But it all begins with the story." We do have a few quibbles, however. For starters, it's a little odd to walk down Route 66 in Radiator Springs, board the ride, and then ride along Route 66 into a note-for-note facsimile of the town inside the attraction. Even odder: During the day, passengers amble along Route 66 in full daylight, but enter into the ride's version of Radiator Springs where it is perpetually nighttime. They then emerge back into the daylight for the race finale. For the sake of story continuity, we think a night ride is more enjoyable. Our eyes also had to adjust to the dark indoor scenes during the day, and we found the visuals through the car's windshield a bit more compromised. At night, the race sequence felt more out of control (in a good way), particularly the final drop into the fog-filled Taillight Caverns. Quibbles aside, we more or less agree with Rafferty who places Radiator Springs Racers in the same rarefied company as Disney's all-time classics, Pirates of the Caribbean and Haunted Mansion. We say more or less, because those two attractions set the bar for Imagineering achievement, and the Cars-themed ride doesn't quite hit the mark. But it is an extraordinary must-see attraction that takes its rightful place among the best Disneyland Resort rides. You'll get your kicks and then some on the remarkable Route 66 attraction.